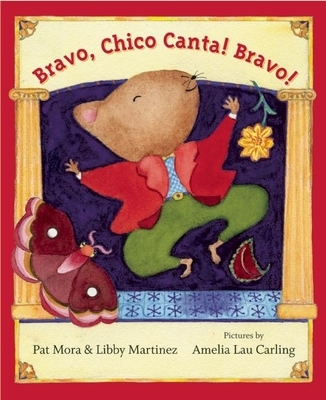 Chico Canta, the youngest of 12, is a tiny, mischievous, fearless mouse who lives with his family in an old theater. They love to go upstairs to see the plays and echo the audience shouting, "Bravo, bravo " as the curtain falls. Mrs. Canta speaks many languages -- not only English, Spanish, and Italian, but Spider, Cricket, and Moth as well. And she encourages her children to develop their own language skills. "Bilingual, bravo " she is always telling them. One evening, after a wonderful performance of The Three Little Pigs, the mouse family narrowly escapes Little Gato-Gato. But, undaunted and inspired by the production, they decide to mount their own version of the play. On opening night, however, it is tiny Chico who is the star of the show when he spots Little Gato-Gato in the shadows and uses his own special gift for languages to avert disaster.